More than a dozen influential African American alumni from Wabash College gathered in Indianapolis to explore ways they could have an impact on getting more black men to go to college. Convened by Daryl Johnson, president of the Indianapolis-based trucking firm Manufacturer’s Transport, the meeting sought ways to increase the number of African American men attending Wabash. Eight representatives from Wabash College, including President Andy Ford, attended the meeting, which was held at the Center for Leadership Development at Indianapolis. "I look back now, more than 20 years after I graduated, and know that I made the right decision to go to Wabash," said Johnson, who graduated in 1982. 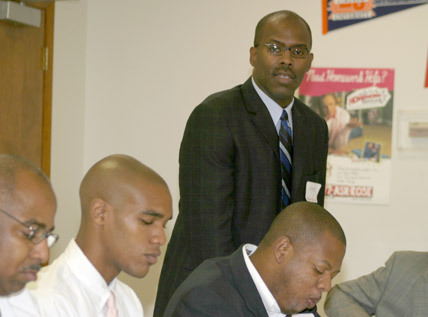 "I know that as alumni we can have a significant impact on the men who want to attend. We can make it clear to them how Wabash can change their lives." Wabash Dean Raymond B. Williams told the group the recent six-year graduation rate for the 3,900 African American men from Indiana who began college in public universities is a scant eight percent. In contrast, Wabash’s four-year graduation rate for African American men is higher than 50 percent and is nearly 70 percent after six years. "It’s my job as dean to make sure the students who attend Wabash graduate," said Williams. "It’s clear from the data that those men who go to private schools have a much better chance of graduating from college." The meeting was a continuation of discussions that began more than a year ago when Ford brought together a group of African American alumni from Wabash to address the problem. "We started these lunches a year ago and I hope you have seen some of the results put into action," he said. Wabash has traditionally ranked among the most successful private colleges in the country in the percentage of enrolled African American students. Wabash ranked eighth nationally among liberal arts colleges according to the Journal of Blacks in Higher Education. The statistics are even stronger when considering Wabash is a men’s college, and African American women outnumber their male counterparts in college by a two-to-one margin. "I came away from the meeting with the sense that the alumni in the room want to play a strong role in serving future generations of Wabash men," said Wabash Dean of Admissions Steve Klein. "One of the best ways to do this is through recruiting. I look forward to these men working in the community with other alumni and our staff to make Wabash more visible and accessible." "This is a process, not an event," said alumnus Steve Jones, director of human resources for the Healthcare Group. "It’s not going to happen over night. It’s clear that we as African American men are unique and only we can articulate what it’s like to attend a private college. But all of us would also agree that it was worth it, that we are successful today because of it." Wabash alumni in attendance included Indianapolis Deputy Mayor Eugene Anderson ’83; Keith Veal ’92; Steve Jones ’87; former Indiana State Representative Cleo Washington ’85; Parker Sawyers ’05; Eric Young, MD ’83; Alonzo Weems ’92; Vincent Scott ’85; Milton Turner ’05; Franklin Breckenridge ’91; John Archie ’96; George Lino ’96; and Johnson. "Wabash isn’t an institution that traps you into positions; it opens doors and presents opportunities," said Johnson. "Wabash is a family, and the students, faculty, and alumni look after one another and take care of each other. We need to work collectively — as African American alumni — to bring about change, have an impact on the students of Wabash, and help young men from Indianapolis attend Wabash. Because we know firsthand that it will change their lives." Recent surveys have indicated a steady decline in the number of African American men who attend college, and there has been a corresponding decline in graduation rates. Wabash College, located in Crawfordsville, established the Malcolm X Institute for Black Studies in 1971, the only such center of its kind in the country. A new $2 million MXI was dedicated in 2003 and features classrooms, library, computer lab, den, kitchen, and offices for student leadership. 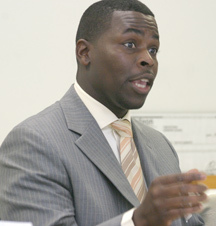 Horace Turner has served as the MXI’s executive director since its founding. "Each of you in this room know the type of education Wabash provides and the Institute is just one aspect of it," said Turner. Johnson concluded the meeting by pledging his full support to Wabash’s administration to work diligently in promoting Wabash as a college option for African American students. "You can’t change the past and can’t predict the future. I’m concerned with what happens today. So ask yourself as you leave, ‘What can I do to help the young men of our community today?’ "
Top: Daryl Johnson ’82, recently elected member of the Wabash College Board of Trustees, welcomes a group 12 other African American alumni and eight administrators from Wabash to the Center for Leadership Development in Indianapolis. Left: Alumnus Keith Veal ’92 owns his own Indianapolis business and is a facilitator at the Center for Leadership Development. 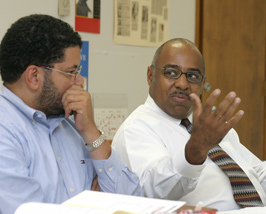 Bottom right: Eugene Anderson ’83 makes a point during a discussion, while Steve Jones ’87 listens.